A significant milestone indeed for us, and a cause for double celebration, as we just turned 4 years old a week earlier! Together, we have changed the lives of not just 10,000 homeless animals, but the lives of 10,000 families as well, as there would undoubtedly be so much fun, joy and laughter brought to them with the adoption of these cute, adorable furry companions. Every single adoption involves painstaking effort by rescuers to save the animals, nurse them back to health, seek out adopters, assess them and finally send them off to good homes. Not to forget the animal lovers who've played a crucial role in spreading the word as well! Imagine how much dedication, hard work and resources these respectable teams have spent to help 10,000 animals. It is no simple feat indeed and they really deserve a huge, standing ovation! We sincerely thank you for your support, and we promise to work even harder to improve the welfare of animals! 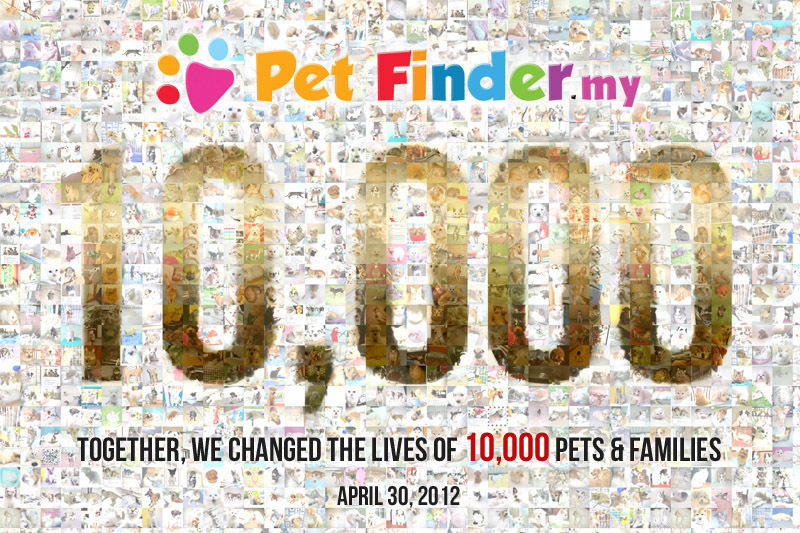 Enjoy this photo mosaic of the thousands of happy pets that found homes through PetFinder.my! Re: 10,000 Pet Adoptions Achieved! Congrats with the achievement of 10K Pet Adoptions.